Low-fat yogurt with 1 teaspoon of 100% fruit jam and fresh berries. For the past two weeks I’ve been on this program to shed some weight. Even though the diet allows you to eat quite a range of food, I’ve found it more challenging than I expected. We’ve been traveling a lot, including a trip to Berlin on business, and that’s made it harder to plan meals and prepare food in advance. On the upside, I also decided to quit diet coke on the day I started the program, and I haven’t had any relapses. Given I was drinking multiple cans a day, this feels like quite an achievement! Anyway, as promised, here’s my food diary so far. I feel a bit naked exposing such cold hard dietary truths, so don’t judge me too hard :-) Instead I've been drinking lots of green tea, as well as regular tea with a dash of milk, herbal infusions, sparkling water, and plain tap water. I haven't included all of these beverages in my food diary as it would be too tedious to read and, other than the occasional dash of milk, they're calories free. Note: I know it’s not advisable to weigh yourself every day, but I’m doing it anyway for the duration of this diet so I can accurately track my progress (and because I can't help myself). 8:10 a.m. Hot water with lemon juice. 2:30 p.m. 2 soft boiled eggs and a tomato salad with red wine vinegar. We're back at our Airbnb for Rosie's nap, after having gone to the grocery store, so I'm in better shape to prepare some meals now. 8:30 p.m. Half a grilled chicken breast, steamed broccoli, and sauerkraut. Dinner is a bit later than I would have liked as we had another afternoon meeting, and then needed to get Rosie organized for bed. Feeling quite tired, with a bit of a headache. Tomorrow will be more organized! Enjoying an espresso in a coffee shop along the Landwehr Canal in Kreuzberg, Berlin. 7:50 a.m. Hot water with lemon juice. Woke up tired and with a headache. Boo. 8:25 a.m. Low-fat yogurt with 100% fruit jam and berries. Yogurt never tasted so good! 10:30 a.m. Espresso. We had a nice walk through Berlin to our morning meeting, and stopped at a coffee shop along the way. 12:30 p.m. Red pepper crudites, and 2 soft boiled eggs. Back home from our meeting for Rosie's nap. I'm using this time to cook some cabbage soup. 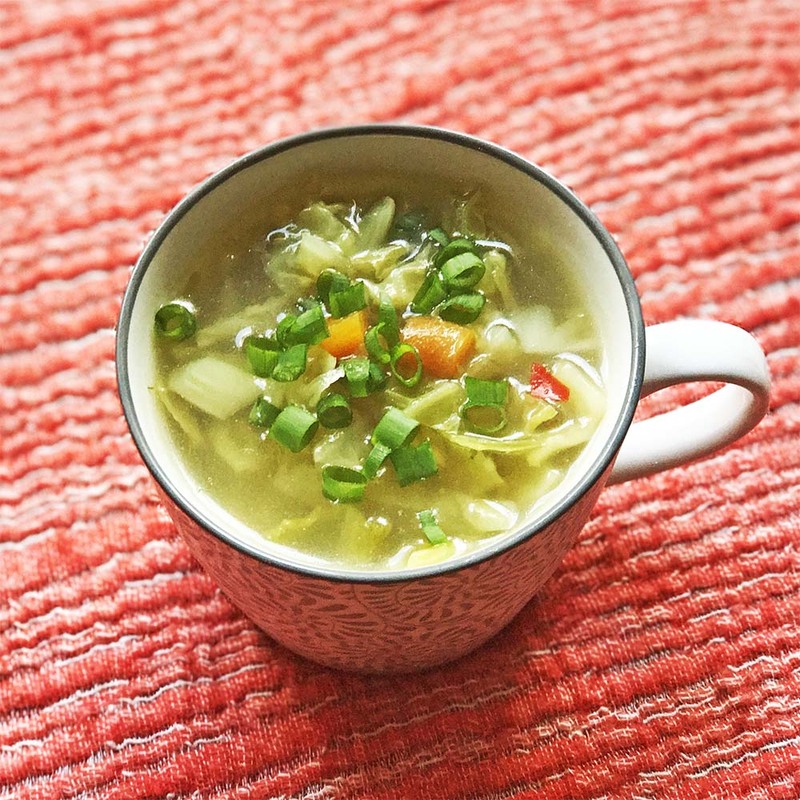 2:00 p.m. Cabbage Soup. Tasty and wholesome. 7:00 p.m. Grilled chicken salad. After a massive walk around Berlin (we clocked 19,000 steps today with Rosie) we stopped for dinner at the Greek Taverna near our Airbnb. Luckily they had a salad on the menu that was made entirely with veggies on the list, and they served me the dressing on the side. 7:40 a.m. Hot water with lemon juice. Woke up feeling fantastic - woohoo! 8:30 a.m. Low-fat yogurt with 100% fruit jam and berries, plus 2 scrambled eggs. I've been feeling like I need more food in the morning, so today's breakfast is a bit more hearty and includes some protein. 12:30 p.m. 2 mandarins. Already hungry - luckily I had these in my handbag. 5:00 p.m. Smoked salmon. Snacking on some of Rosie's dinner. I didn't eat enough at lunchtime again. 6:00 p.m. Grilled chicken, steamed brussels sprouts, beetroot and red cabbage salad. I'm getting into the swing of things now. 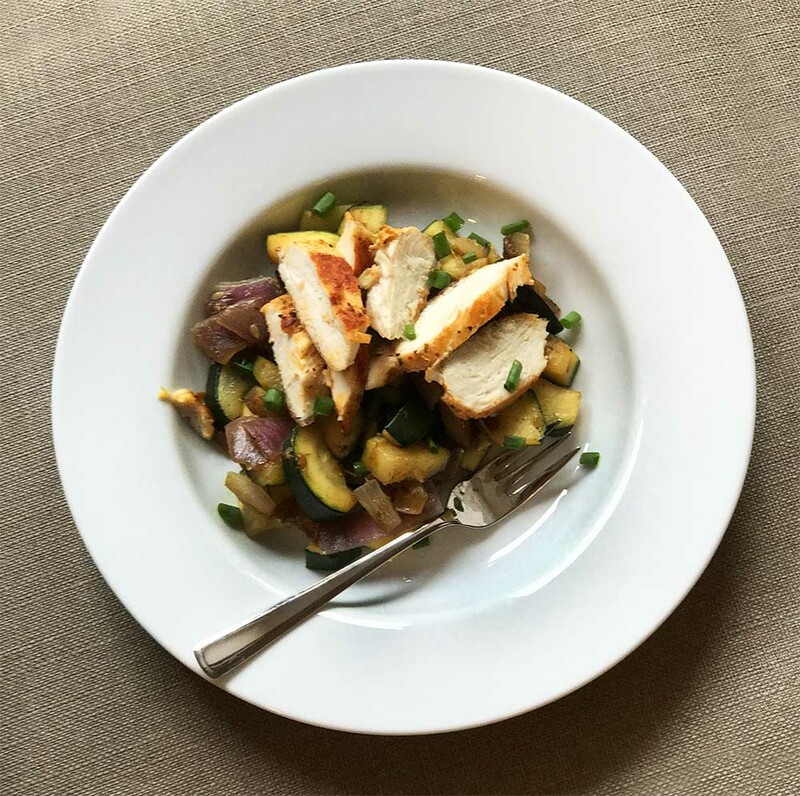 Grilled chicken with stir fried red onion and zucchini. 7:40 a.m. Hot water with lemon juice. 8:00 a.m. Low-fat yogurt with 100% fruit jam and berries, 2 scrambled eggs, and a mandarin. Now this is starting the day off right! 11:45 a.m. Grilled chicken with stir fried red onion and zucchini. We had a quiet morning at our Airbnb today, so I was able to cook us an early lunch before heading out to our afternoon meeting. 7:30 p.m. Cabbage soup, followed by grilled salmon with a beetroot and red cabbage salad. I've eaten more today, and had protein with every meal, and I haven't felt tired or hungry at all. Yay! 8:30 a.m. Hot water with lemon juice. 9:30 a.m. Low-fat yogurt with 100% fruit jam, and 2 soft boiled eggs. 12:00 p.m. Grilled chicken with spinach. 4:30 p.m. Espresso. Lots of willpower was needed to watch Rosie and Justin tuck into 'earl grey and plum' artisanal ice cream (apparently it was delicious). 6:00 p.m. Tomato soup. We had dinner at a German restaurant near Mauerpark. Among the schnitzels and spaetzle on the menu, I found a tomato soup that the chef kindly prepared for me without cream. Rosie proceeded to eat half of it. Apparently tomato soup is her new favorite food. I thought it was a sure bet that she'd be devouring Justin's venison! 8:30 p.m. Cabbage soup. Back at our Airbnb and still hungry, eek. 6:45 a.m. Tea with a splash of milk. I went to bed late and Rosie woke up early. Lemon water wasn't going to cut it. An espresso would have been better but we're out of those special coffee capsules for the machine. Is it going to be one of those days? 7:45 a.m. Low-fat yogurt with 100% fruit jam, and 2 scrambled eggs. This has become my go-to breakfast and it's pretty satisfying, although it's getting a bit repetitive. 12:50 p.m. 2 olives. Note to self, if you want to eat on the plane, you need to bring your own food! 5:30 p.m. 1/2 red pepper and a bag of iceberg lettuce. We arrive in France and drive straight to the supermarket. I devoured the bag of lettuce while we shopped, and the red pepper in the car. Things are a bit sad and desperate on the hunger meter. 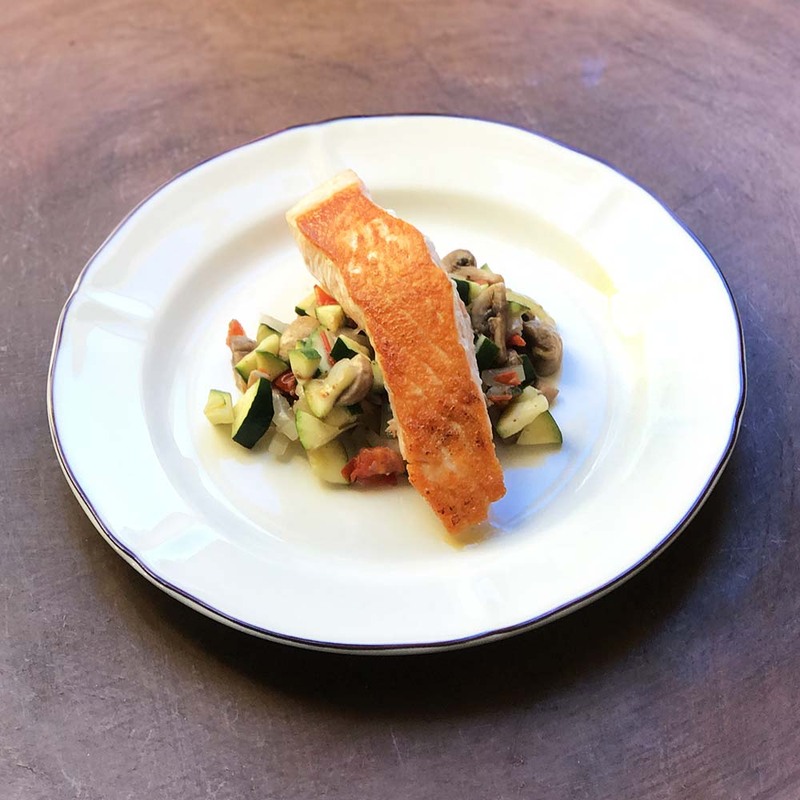 7:45 p.m. Grilled chicken breast and grilled eggplant, zucchini, and cherry tomatoes. This dinner was one of the best meals of my life. OK, that's an exaggeration, but boy did it hit the spot. Food literally tastes different when you're really hungry. Endive, radish, and mushroom salad. 7:45 a.m. Hot water with lemon juice. 8:20 a.m. Low fat prune yogurt with 3 prunes. We're currently staying in Lectoure which is around 40 minutes drive to Agen, the prune capital of France. Unsurprisingly, prunes feature a lot here, and they're unbelievably delicious. Breakfast this morning tasted like desert. Yum! 12:30 p.m. Green salad with tomatoes, cucumber, and cornichons. The waitress at the cafe was desperate to add something to my boring salad (cheese! croutons! foie gras!) and I can sense that this might be a recurring issue in French restaurants. I do understand where they're coming from though. 1:45 p.m. Espresso. First day with 2 coffees! 6:15 p.m. Fish soup, and a side salad of endive, radish, and mushrooms. I found a really healthy fish soup in the supermarket, and it was really excellent. Surprisingly, Rosie liked it too which is a double bonus. 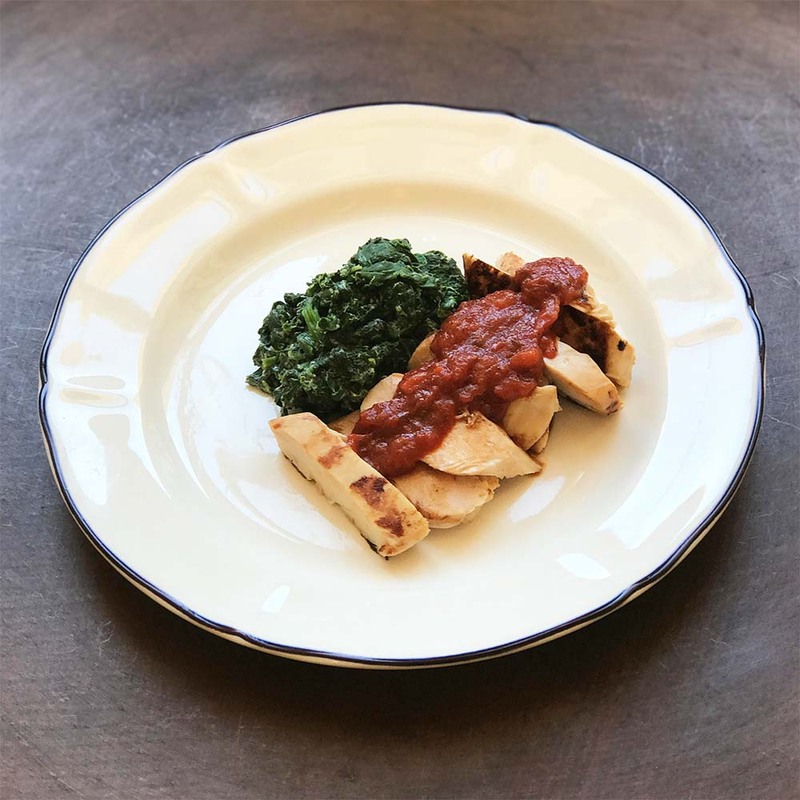 Grilled chicken with spinach and store bought tomato passata. 8:15 a.m. Tinned pears, peaches and apricots, yogurt, and 2 scrambled eggs. The apartment we have rented has a great kitchen, and an amazing non-stick fry pan. I made these eggs with no butter or oil and they tasted great. If I was making them at home, I'd add some truffle salt like in this recipe. 12:20 p.m. Grilled chicken breast and spinach. I used a store bought tomato passata as a sauce for the chicken, and mixed some natural yogurt into the spinach to give it a creamy texture. 8:30 p.m. Grilled white fish, and mixed vegetables. We had dinner at a lovely, romantic restaurant in Lectoure, but trying to find something on the menu that I could eat was tough. To give you some idea, there were exactly zero vegetarian options for starters or mains. Only in France! 7:30 a.m. Hot water with lemon juice. 8:15 a.m. 2 scrambled eggs. I have to admit, I've been saving granola recipes over the last few days - clearly I'm ready for a change from eggs and yogurt! 2:15 p.m. Apple, mandarin, prune yogurt, and an espresso. It's 15 minutes past the 2:00 p.m. cutoff for fruit, but I need a pick me up and we have a lot of running around to this afternoon as soon as Rosie wakes up from her nap. I figure 15 minutes isn't the end of the world. 1:30 p.m. Stir fried vegetables and a salmon filet. So nice to have a change from chicken! 6:45 p.m. Fish soup and stir fried vegetables. Tonight's dinner is all about leftovers. More stir fried vegetables; zucchini, mushrooms, red pepper, and onion. 8:30 a.m. Tub of raspberry yogurt. I'm having some strange food cravings on this program, like full fat milk lattes, sugar in my tea, bananas, and cake. I don't normally have a sweet tooth, but this diet is making me lust after dessert in a very uncharacteristic way. It's a bit of a scary thought, but I wonder if I'm having sugar withdrawals? 1:30 p.m. Martinique chicken stew. We bought this stew from a vendor in the farmer's market, and it was so satisfying. There were some plantains and potatoes in the dish that I set aside, but otherwise it was made up of approved ingredients with lots of flavor from spices like saffron, turmeric, ginger and cinnamon. It really made me realize that this diet would have been so much easier if I’d chosen to do it during a period when we weren’t traveling, so I could meal plan properly and cook a more interesting variety of foods. Eating out a lot hasn’t helped either. That being said, our schedule at the moment is hectic, so I’d rather do it now under these circumstances than not do it at all. 6:45 p.m. 2 bowls of tomato soup. Store bought, but no naughties on the ingredients list. Unlike most restaurants in the French countryside, French supermarkets have a pretty good range of healthy pre-made food options. The market vendor selling the deliciois Martinique chicken stew! 8:15 a.m. Yogurt mixed with 4 chopped up prunes. One thing I'm not getting bored of is French yogurt with Agen prunes. It's got me thinking that they'd make a delicious homemade ice cream, which would be a fun project post-diet. 1:15 p.m. Green salad to start, followed by a plate of seasonal vegetables. We had lunch in Toulouse today as we had a bunch of errands to run in the city. I didn't do any restaurant research on this occasion, we just stopped somewhere convenient. Justin's lunch was fine, but mine was dreadful. It would be really tough to be vegetarian in France! 8:10 p.m. Roast chicken with roast carrots. Cooked by Justin which made it doubly good. 7:50 a.m. Hot water with lemon juice. 8:25 a.m. 2 scrambled eggs. 1:00 p.m. Mixed vegetables to start, followed by partridge with brussels sprouts. Today we met with friends for Sunday lunch at a lovely restaurant we’ve been wanting to try for a while. I stoically gave Justin my 3 amuse bouche but, before you reach for your tiny violin, there were some good options on the menu for me on this occasion and lunch was an absolute treat. Phew! 12 days down, 5 days to go. This has been tougher than I expected, especially with the scales being stagnant the last few days. Grrr.